The purpose of Stonehenge is lost to us. There will always be debate about its meaning. I grew up in England, although I wasn’t born here. I’m not in Australia, I’m visiting the country that isn’t quite home, with my Australian teenage daughter who isn’t quite at home here either, while we both try to make sense of the weave of family (her) and familiar landscapes (me) that make England part of who we are. Or not. 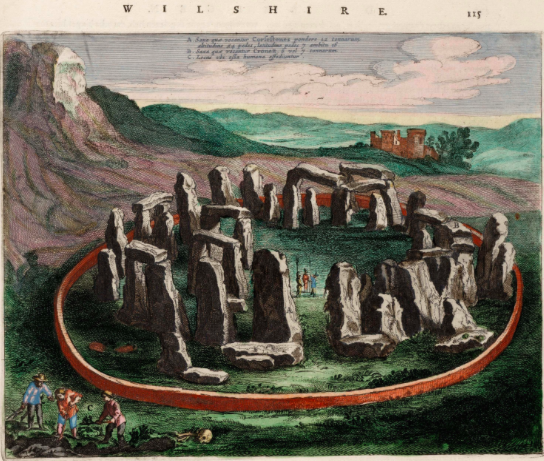 So it made sense to us to go to Stonehenge, because that was my landscape at her age. We battled the wind and the tour buses and the queues, and then sheltered from the weather with a turn around a small educational display of immersive diorama and interpretive panels: educators’ best guesses at everything Stonehenge might represent, pitched for tourists and school parties on their way to the gift shop. 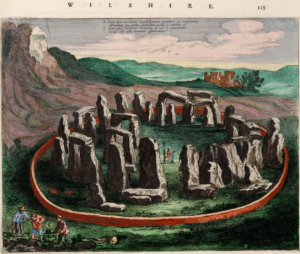 Historians of Stonehenge—and the larger network of burial mounds and earthworks in the surrounding fields—are stuck with the fact that no one knows for sure why it’s all there. The explanatory panels have a provisional feel. What sense did these stones make to the humans who hauled them there and set them up with such precision? We don’t know. What we have instead is a history of conjecture: paintings and maps and interpretation and use. And now we also have ticket pricing, and audio tours, and the opportunity to bundle Stonehenge in with other sites managed by English Heritage at a discount. This puzzle of a monolithic presence that’s so familiar you can hardly see it as strange has been in the back of my mind as I’ve been working with a lovely group of people on a conference whose topic is higher education. We were originally invited to create a conversation between scholars and practitioners with differing views on digital learning, but to me this is an opportunity to ask the bigger questions of the higher education systems we have all inherited: just what are these stones doing here? What are the most pressing uncertainties, and the most promising applications of digital networks for learning and the academy? What agenda should be set for research in the near term? How best can researchers develop and share insights that will achieve practical outcomes and address systems-level challenges facing higher education, while establishing and applying robust standards of ethical practice? Because this is a big set of questions, we’ve broken it up a bit with themes: ethics of collaboration; individualised learning; system impacts; innovation and work; sociocultural implications. I’m not sure these are entirely clear, but I hope that the ambiguity is productive. It’s certainly sincere: higher education should be difficult to reduce to simplistic abstractions, although the edtech stakeholders currently explaining education to everyone seem to have missed this memo. So we’re approaching this as researchers and educators, and hazarding some questions about how higher education might make sense in specific places. Some of these respond to the provocations that higher education has faced in the last few years. All of them emerge from a conviction that we can no longer sensibly debate the meaning of digital learning in the abstract, as though the institutional and social context where it’s in use won’t fundamentally reshape what it is being used to do. It really does make a difference if the target is international market penetration as opposed to reduction in domestic cost overheads as opposed to regional equity. So let’s stop generalising about students, teaching, learning, technology, faculty and administration. Reforms that spring up in one place won’t be helpful in another; technologies that transform learning for some students won’t necessarily have the same effect for others. What we are most likely to be able to share around networks of research collaboration are useful questions, and practicable ways of asking them. At the same time, we need to understand that power is distributed very unevenly throughout the global network of higher education institutions. If digital innovation is left to the market, we will continue to see scale and standardisation dressed up as personalisation and differentiation. So it seems timely to have a productive conversation about educational diversity, and to ask how we can expand access to learning in a way that sustains it. What does not appeal to me is when people talk about the MOOC model, where they say, “At our megaversity, we have a professor who can give you an absolutely authoritative set of lectures on the following technical subject. And then, in your colleges, your professors can lead the discussions on them.” I kind of want to say, “You haven’t seen our lectures.” That’s one thing I want to say as a devotee of small colleges. But also, it’s sort of like, here’s a piece. That lecture becomes like a textbook, purely a textbook. There’s no reciprocity in it. It’s all worked up. To recognise digital learning as the practice that networks small higher education institutions to global circuits of influence and profit, we need to think about this working up—this strategic withholding of reciprocity that has made MOOCs such Trojan horses for reform. What are the obligations for care that should accompany the power to impose curriculum from one place on learners at another? What are the implications for longer term sustainability of research-led teaching in smaller institutions around the world? How does withheld reciprocity connect to the state of the academic labour market and the everyday working conditions of the academic precariat? These are difficult conversations, and it feels like the right time to be having them. dLRN15 will happen at Stanford University, October 16th-17th, and this is an invitation: please come and join us. We’re delighted that Mike Caulfield, Marcia Devlin and Adeline Koh have accepted our invitation to set the tone as our keynote speakers. We really want to welcome scholars, researchers and practitioners who, like us, have more questions than answers, and are ready to look at higher education with a stranger’s eye. For more on the conference, here’s the website. The call for proposals only requires a brief abstract, so just make a cup of tea and you’ll be done in a flash. To inspire you, here are some thoughts from two of the other organisers, Bonnie Stewart and Dave Cormier. The whole thing is under the shingle of the Digital Learning Research Network at the University of Texas at Arlington, funded by the Bill & Melinda Gates Foundation, and George Siemens has rounded us all up. We’re also supporting the Inclusive Fees campaign with lower rates for adjuncts, the underemployed and freelance/independent scholars or practitioners. I may be a little behind the curve when it comes to MOOCs but it does strike me that they are no more or less than the old fashioned idea of public education applied to the digital age with a smattering of brand development thrown in for good measure. What matters, and what I believe in my naive way, is that most people will see these initiatives for what they are and that whilst those who are attracted by the bright lights and baubles will be matched in equal measure, or at least eventually (the prodigal son?) by those who value the local, the community based, hence the importance of the small, locally/regionally based institution. The important piece is that senior management in those institutions are very clear about what their mission is,; and it is not to move up10 , 15, 20 … points on Times, QS etc rankings. 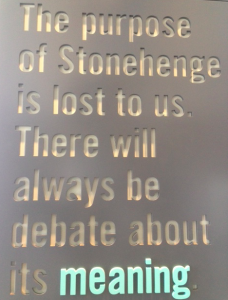 On my trip to Stonehenge, we got there too late for the official your and explicative signs. So we stood outside the fence, watched the sun set, and devised a few stories. There is much less mystery on its origin, yet the same question? Who put those large foam blocks there? Brilliant metaphor, that’s what I am trying to say, as the utter loudly in the UK– BRIILIANT!